I am retired from the US Air Force and was stationed in Paraguay from 1988 to 1991. In response to your request, I have some details on the aircraft, which I knew as FAP 2002. The Paraguayans had 2 Catalinas in their aircraft "cemetery" when I arrived in May 1988. Around Aug. 1988 I was visiting their base in the capital city, Asuncion, and noted they were refurbishing 2002. The then president, General Alfredo Stroessner's, birthday was in early November and each year the Paraguayans celebrated it with a big military parade downtown as well as numerous official receptions. The Paraguayan Air Force (FAP) desired to fly the Catalina, along with all of their other flyable aircraft, in the aerial review over the parade. They hung C-47 engines (R-1830-?? ?, I don't remember the suffix) on it, since they had several for their small C-47 aircraft fleet. The day before the parade, one of their best pilots flew it on a test flight from the base's grass strip. Preparing to land, the gear wouldn't lower. He then pulled the alternate gear extension handle. It was rusted and came undone in his hand! Unknown to the pilot, it turned out the mechanics had not connected the alternate gear extension system! He managed to safely land the aircraft gear up on the grass strip causing some sheet metal damage. The FAP mechanics worked all night to get the aircraft ready for the parade the next day. It flew over the parade, with the gear remaining extended of course, and landed uneventfully afterward. The Paraguayans parked it and it didn't fly during the remainder of November, December and January, which is vacation time during their austral summer. In early Feb 1989, the army carried out a coup on General Stroessner. Nobody cared to spend any more money on the Catalina so they parked it again in their aircraft cemetery and didn't fly it again. I understand, but can't confirm, that FAP 2002 was the Paraguayan presidential aircraft in the 1950s. General Stroessner was the Paraguayan president from 1954 to 1989. In 1955, in response to a military coup, Argentine President, General Juan Peron, took refuge on a Paraguayan naval boat docked in the Buenos Aires, Argentina, harbor. General Stroessner dispatched FAP 2002 to Buenos Aires to bring General Peron to Paraguay in exile. I'm attaching a scan of a photo from the 1988 Christmas Card the FAP commander sent me, which shows a picture of FAP 2002 taking off on Nov. 3, 1988. FAP 2002, along with its sister Catalina, were still in the FAP's aircraft cemetery when I left in 1991. I don't know the details of how it ended up back in the United States. I assume the US government donated it to the Paraguayans at some point after World War II in the Military Assistance Program, MAP. If so, they would have had to obtain the US government's approval to sell it or even give it away. I hope you find this information useful. Do you know where Catalina N96UC is now?" Life began for this Flying Boat as 48375 for the US Navy and exactly how it got to Paraguay I don't know. One Frank Porter had FAP 2002 at some point registered as N96FP. This Catalina ("Canso") was registered N96UC for Universal Associates Inc in Aug96. During 1996 it had amassed 4188.75 flying hours and was reported at Miami-Tamiami airport in 1997. During 2005 I learned that N96UC hadn't flown because extensive corrosion in the wings had been found. It had been registered to Charles E.Largay of Highlands,NC on 27Oct05. -Webmaster oct.2006. Graham Robson remembers this from his April 1998 air-to-air shoot: "This was shot from the open hatch of (the late) Rob Carlson's HU-16B 51-5909 (which was in full USAF scheme), on a flight from Sun 'n Fun to Lakeland,FL. I had arranged this photo shoot specially, as there was also Jack Bart's Grumman Mallard in the formation." N96UC is a Canso PBY-5A with c/n 1737. I have Michael Prophet to thank for making this photo of N96UC available to me. "What is particularly interesting here is the mention by Gene of the second PBY. There is some doubt about the actual identity (c/n and BuAer serial etc) of the second FAP PBY-5A and it has been the subject of some correspondence between myself and a couple of fellow researchers. However, regardless of the actual identity, it is known to have been ZP-CBB and T-31 in FAP service but I have it as being written off after a sinking in August 1957. 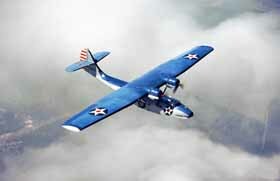 So, if that was correct, what was the identity of the second PBY seen at Asuncion in 1988!!!" "I definitely saw two Catalinas in the Paraguay Air Force's (FAP) aircraft cemetery in 1988. ZP-CBB may have been the second one. In 1988 the FAP cemetery contained 20 or so C-47s, one DC-4, various other aircraft, along with the 2 Catalinas. All of them were severely deteriorated from the tropical sun and rains--Asuncion's climate is much more humid than the desert in New Mexico and Arizona! I speculate the second Catalina was ZP-CBB and that it is the one that was written off after a sinking in one of Paraguay's rivers in August 1957. The Paraguayans probably retrieved it from the river and deposited it in the cemetery. General Stroessner had a special place in his heart for the Catalina, after all he dispatched FAP 2002 to Buenos Aires to pick up his friend General Juan Peron. Moreover, it was General Stroessner's affinity for the Catalina that led the FAP to restore FAP 2002 for the parade honoring General Stroessner's 1988 birthday. No doubt they selected FAP 2002 (N96UC) to place in service because ZP-CBB was not in condition to be made flyable. In addition, I'm certain the FAP mechanics cannibalized any parts they could from ZP-CBB to make FAP 2002 fly." I was involved in preparing this Catalina; during 1988 I travelled to S.America for the umpteenth time... But it was my first trip to Paraguay, esspecially for this Cat. I am certain that there was no 2nd Catalina; mr Richardson may be confused by time. I know that at first the Cat was located at Nau Camp, near the International airport of Asuncion, later flown from Nau Camp to Asuncion Int'l. To make sure I checked this with Michel Anciaux, who has been there many times and he checked it again with Antonio Sapienza (who wrote a book about the history of LAP and anything he doesn't know about aviation in Paraguay isn't worth knowing...) and they agreed there were no 2 Catalina's at Campo de Nu Guazu, but only one. alas..! Also, the remark about there being one DC-4: not correct either (but there were 3 C-118s of the F.A.P. and a mistaken a DC-6/C-118 for a DC-4 is not uncommon). 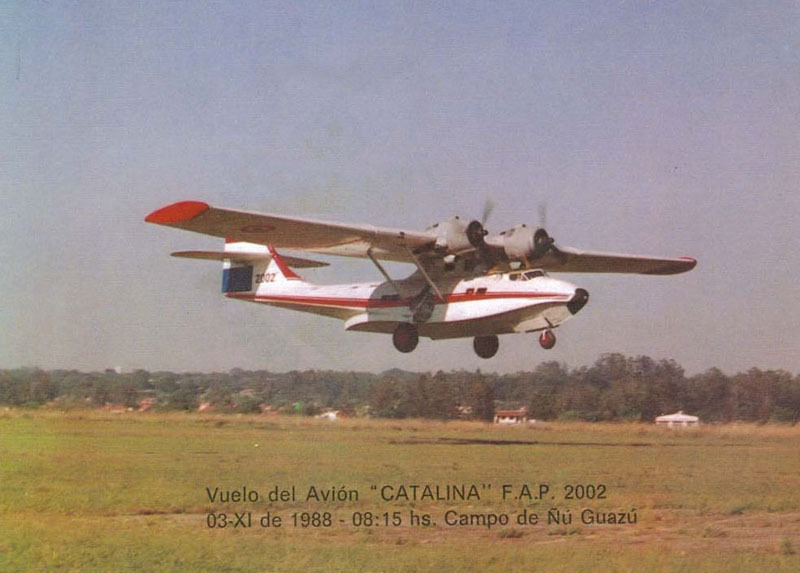 "After reading the updates to the message I wrote in Oct 2006, about the Paraguayan AF Catalina, I now believe my memory was faulty and there was not a second Catalina in Paraguay in 1988... I seem to recall hearing about another ('the second') Catalina had crashed in a river years earlier and was not recoverable; but I am beginning to doubt my memory, at was almost 20 years ago. Ron Mak's comment regarding me confusing the C-118 and the DC-4 is also correct." More FAP2002 and other photos by Ron Mak, in Paraguay and other destinations.